NOTE: Please CLICK ON the above Photo for a LARGER View of the WAVESHAPER™ Frequency Instrument. DISCLAIMER: The WAVESHAPER™ Frequency Instrument is to be used "FOR EXPERIMENTAL PURPOSES ONLY". NOTE: Before you purchase the preceding BIO-ELECTRONIC STIMULATOR, please read ELECTROTHERAPY DEVICE - DISCLAIMER & PRECAUTIONS. If you want to know your LEGAL 9th Amendment Medical Rights, then please read NOTICE AND DECLARATION ! Also if you're a Healing Practitioner, then please read UNAPPROVED MEDICAL DEVICES - EXEMPTIONS. The WAVESHAPER™ Frequency Instrument, while generating a SPECIFIC Frequency/Pulse Rate, is to be used to RESONATE Pathogens, DETOXIFY the Body, REGENERATE the Body and BALANCE Metabolic Deficiencies, such as Arthritis, Headache, Insomnia, Diabetes, High Blood Pressure, Psoriasis, Major Pain, Wound Healing, Depression, Kidney Insufficiency, Joint Injuries, Thrombosis, Spondylitis, Fatigue, Emphysema, plus MANY other Health PROBLEMS. In the past, Rife-Type Frequency Instruments with these Features and Capabilities were priced $1000+. The WAVESHAPER™ Frequency Instrument has NEW DDS (Direct Digital Synthesis) Technology combined with the LATEST Microprocessor Chip Technology, bringing the Cost DOWN to a MORE AFFORDABLE Price! The WAVESHAPER™ Frequency Instrument can NOW be in the hands of People, who aren't ABLE to AFFORD the EXPENSIVE Rife-Type Frequency Units, and who also want SAFE and EFFICIENT Operation, plus POWERFUL Results! 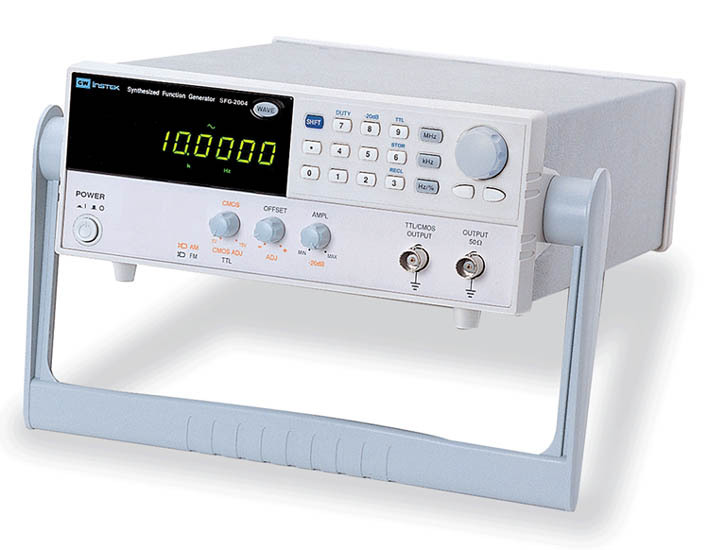 The WAVESHAPER™ Frequency Instrument is a HIGH Quality Function Generator, that's being used as an EFFICIENT Rife-Type Frequency Instrument. The Accessories (see below) are being made up by me, Tom Harrelson, having had ALMOST 50 years of Experience in the Alternative Bio-Medical Electronics Field and over 20 years Experience in Rife Technology. DDS (Direct Digital Synthesis) And FPGA Chip Design Ensures Digitally ACCURATE (0.1 Hz. resolution) Frequencies. CONTINUOUSLY Variable Frequency Control With Rotary Dial. DIRECT Keypad Entry Allows ERROR-FREE Output Of The SPECIFIC Frequency. STABLE Tuning From 0.1 Hz. Up To 4 MHz..
10 Groups Of Setting Memories. 50 ohm load 20%-80% below 1 MHz. (square wave only) 0-5 V.
0.1 Hz.-4.0 Mhz. - Triangle 0.1 Hz. DIMENSIONS - 4.2" H. X 10.5" W. X 11.5" D.
NOTE: The WAVESHAPER™ Frequency Instrument is to be used to do Frequency Therapy, but is NOT a Stand-Alone Instrument and must be used with one or MORE of the Accessories below. The WAVESHAPER™ Frequency Instrument has a SPECIAL Click Step Tuning Knob, which can be used to EASILY tune + 5 Hz. of the SPECIFIC Frequency, so that you can RESONATE MUTATED Pathogens, if and when a SINGLE Frequency has NOT been working! In a COST-EFFICIENCY Advance OVER MANY other Rife-Type Frequency Units, the WAVESHAPER™ Frequency Instrument has a Price for the BUDGET-MINDED Person. Buttons: OFF/ON Power, Numerical Frequency Keypad, Hz./KHz./MHz., Duty, -20db, TTL, Store, Recall, Shift & Shape. Control: Amplitude (0 - 10 V.p-p)/Tuning (+/- 1 Hz. ), Offset (+/-) & TTL/CMOS (0-3 V./0-4 V. p-p). Display: Frequency (L.E.D. - 9 Digit/Hz., KHz. & MHz.). Jacks - BNC: Output (50 ohms) & TTL/CMOS. NOTE: Customer must be ABLE to print-out the above documentation or make arrangements to pay for copy costs. Purchasing The WAVESHAPER™ Frequency Instrument, Then Please CLICK HERE. Ordering The WAVESHAPER™ Frequency Instrument, Then Please CLICK HERE. Reading MORE Information About The WAVESHAPER™ Frequency Instrument & Accessories, Then Please CLICK HERE.